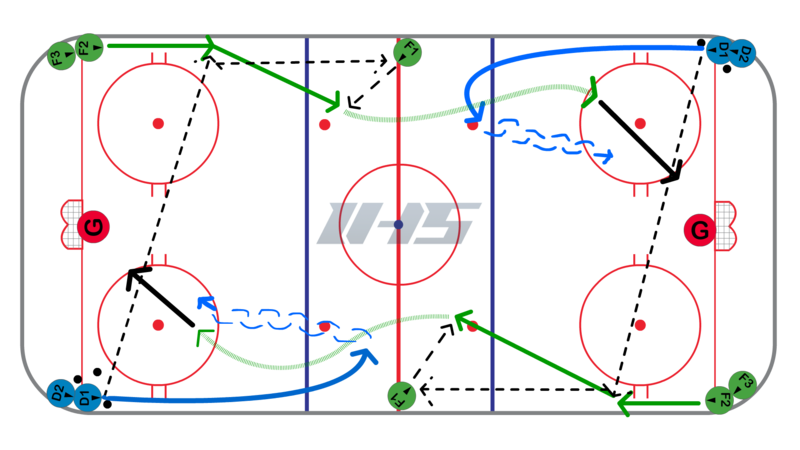 This is a full ice 1 on 1 hockey drill where you place a line of forwards in opposite corners and defense in opposite corners. The pucks are with the defense lines. One foward should be placed along the boards at the red line to start the drill (see diagram). On the whistle the first defender from the defense lines makes a pass across the ice to the first forward and skates straight up into the neutral zone to take on the 1 on 1 from the other end. The forwards will receive the pass, make a pass to the stationary forward at the red line, receive a pass back, and attack the defense from the other end. After they attack the net then they come back to the neutral zone to be the stationary player that makes the "bump" back to the forward. Once both players are in position the coach blows the whistle and the drill is repeated. Hard tape to tape passes to start the drill. Forwards that are attacking should get to off the wall so they have more options when attacking defense. Defense needs to re-take as much ice as possible before transitioning and taking the 1 on 1. Defense should transition to the middle of the ice.